Louisiana is famous for its culinary delights, and the state's rich medley of treats and confections proves its sweet tooth. Creative bakers improvised traditional recipes during days of rationing to create gateau de sirop (syrup cake) and bread pudding. Early customers of Lea's Lunchroom's pies in central Louisiana included outlaws Bonnie and Clyde, who dropped by while they were on the run. During the 1950s, singers Hank Williams Sr. and Elvis Presley hung out at Shreveport's Southern Maid Donuts after performing at the popular Louisiana Hayride country music broadcast. 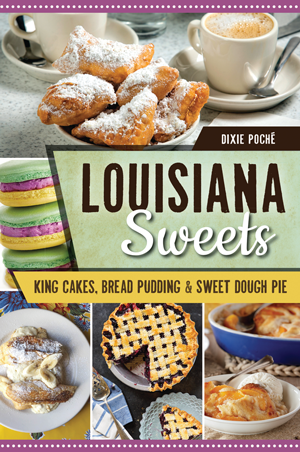 Author Dixie Poché dives into the recipes and history behind such beloved regional specialties as Mardi Gras king cake, flaming Bananas Foster, Cajun Country's pain perdu and many more. Dixie Poché is a graduate of the University of Louisiana–Lafayette in journalism. She is a travel and corporate writer in Lafayette and author of Classic Eateries of Cajun Country, published by American Palate, a division of The History Press. She enjoys doing research at the lunch counter and spends time with lots of Cajun cousins hanging out on the front porch.